Logic running with Logic Node functionality enabled. Notice the tracks in the Arrange window assigned to run on Nodes (the Node buttons are glowing blue), the System Performance meters, and the Network usage in the Activity Monitor application's window. 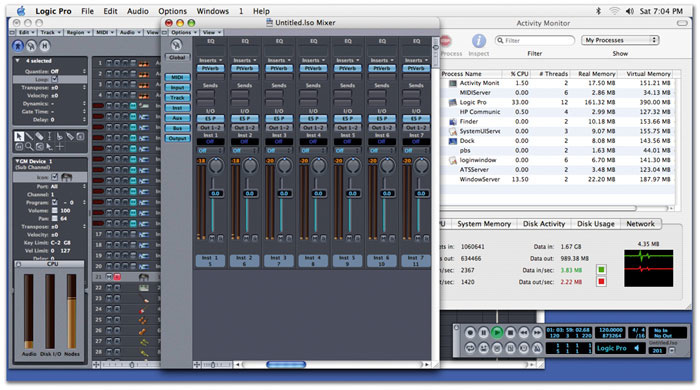 We've discussed Logic 's distributed audio processing in past Apple Notes columns, but this month we offer some tips on setting up Logic Node to run on a network of headless Macs, along with some advice on Firewire-based networking. When Apple introduced Logic Pro 7 towards the end of last year, perhaps the most intriguing new feature was the so-called distributed audio processing that we've discussed several times in previous Apple Notes columns. In a nutshell, distributed audio processing works via a small application called Logic Node that's installed on the other Mac computer (or computers) that should be used for audio processing. This month, we're going to look at how to actually make use of Logic Node. Using distributed audio processing in Logic is incredibly easy. First, make sure all of your Macs are connected to the same network and run the Logic Node application supplied with Logic (not forgetting to download the free patch from Apple's web site, if necessary) on your additional Mac systems. The Logic Node application itself has no interface window or any real user feedback, although if you Control-click on the Logic Node icon in the Dock while Node is running, a small text item at the top of the pop-up menu displays either 'Not Connected' if Node isn't connected to a main system running Logic, or the host name of the computer running Logic to which Logic Node is connected. On your main host Mac that's running Logic, open the Preferences window, select the Audio Panel and click on the 'Nodes' tab. Make sure the 'Enable Logic Nodes' toggle is active and you should see a list of available Nodes appear in the lower part of the window. Occasionally I've had to toggle the Enable option or switch to a different tab and back to the Nodes tab again, in order to refresh the list of available Nodes. All of the Nodes you want to make use of in Logic should be enabled, and you can then close the Preferences window. Enable Logic Node functionality from the Node tab of the Audio panel in Logic's Preferences window. To begin with, you'll notice that the System Performance monitor (Audio / System Performance) now has an additional meter for displaying the combined performance of the connected Nodes. To offload the processing of an audio track or instrument object, make sure 'Node Buttons' is checked in the View sub-menu of the Arrange window and then click the Node icon on the required track (the icon looks like three dots in a horizontal row when inactive). If you run into problems when using Logic Node and Logic, you might want to try disabling OS X's firewall from the Sharing System Preference panel. It's also worth remembering that only audio tracks and instruments that use Logic 's own instruments and effects exclusively (with the exception of Ultrabeat and EXS24) can be offloaded to a Logic Node. Any channel that uses an Audio Unit plug-in, Ultrabeat or EXS24 can't be offloaded. Once you start working with multiple computers, it's inevitable that you'll encounter the problem of needing to see and use all of the systems at the same time. The first solution is to have multiple keyboards, mice and displays; the second solution is to buy a KVM (Keyboard, Video, Mouse) switch that allows you to connect multiple computers to a single keyboard, mouse and display and switch between which one is active (without having to reboot). However, the simplest, cheapest, and ultimately the best solution is to use the fact that all of your Macs are going to be on the same network (since they have to be, for Logic Node to work) and employ software that allows you to view other systems on the network as if they were just other applications running on the same Mac. There are many alternative applications available for working remotely with other computers. Apple themselves have a product called Apple Remote Desktop (www.apple.com/remotedesktop), which is a great and comprehensive solution for managing a network of Macs. Unfortunately, its price might be unjustifiable for those wishing to set-up a fairly cost-effective network of Logic Nodes (in the USA, the 10-client version costs $299 and the unlimited license version costs $499). There are, however, some alternatives. Apple Remote Desktop is based on VNC (Virtual Networking Computing), and there are plenty of freely available VNC servers (to put on the Logic Node computer, for example) and clients (which would run on your main Logic machine) that let you do much of what's possible with Apple Remote Desktop. The fundamental difference is that you don't get the Mac-specific management tools, such as those for software distribution and so on, with most free VNC software — although the most important functionality is preserved: opening other Macs via your main Mac and interacting with them. OSXvnc is a freely available VNC server to run on your Logic Node Macs. Now click on the Startup tab, then the Configure Startup Item button. You'll be prompted for your Mac OS X password before OSXvnc goes ahead and installs a Startup Item on your Mac to allow the VNC server to automatically start running every time you boot. It's now safe to close the OSXvnc application, reboot the Mac and disconnect the keyboard, mouse and display, leaving only the power and network leads connected. However, as a final touch you might want to make sure Logic Node starts running as well when you boot up the Mac, which you can do from the Startup Items panel in the User Accounts System Preference panel, by clicking the '+' button and selecting the Logic Node application. Alternatively, simply drag the Logic Node application's icon from the Finder into the list of Startup Items in the System Preference panel. Chicken Of The VNC: a free VNC client you can use on your main Mac running Logic, to remotely access your Macs running Logic Node, without having to worry about multiple keyboards, video displays and mice or KVM switches. Moving onto the VNC client side of things, there's a delightfully named OS X VNC client called Chicken Of The VNC (http://sourceforge.net/projects/ cotvnc), which is, again, freely downloadable. Once this application is running on your main Mac, type in the host name or IP address of the Mac on which you just installed OSXvnc, along with any password, and click Connect. If all is well, the other Mac's desktop should now open in a window so that you can monitor what's going on. If you run into problems, a good first step is to check that Mac OS X's firewall isn't blocking port 5900 (which is used by VNC) from the Sharing System Preference panel, followed by double-checking that the computer is indeed connected to the network and that the host name or IP address is correct. Good luck! While Apple's web site recommends using Gigabit Ethernet (1000-base) as the transport medium for connecting Macs running Logic Node, it is actually possible to use any physical interface that supports TCP (Transmission Control Protocol) for networking. This means that you could, in theory, use higher-bandwidth platforms such as Fibre Channel, or lower bandwidth technologies like 100-base Ethernet or — perhaps more interestingly — Firewire. Since Firewire is four to eight times faster than 100-base Ethernet (running at either 400 or 800Mb/s for Firewire 400 or 800 respectively), it makes a pretty good alternative if your Mac doesn't support Gigabit Ethernet. While I was investigating the Mac Mini recently (for an SOS review), it occurred to me that it might be a neat alternative (or addition) to a Firewire Powercore for Logic users wishing to run a few more Space Designer or Sculpture plug-ins. Of course, the Mac Mini doesn't have the recommended G5 processor or Gigabit Ethernet port, but I found that it was possible to set it up as described in the main text with VNC and run it just like a Powercore with just a Firewire 400 connection. This might be a useful prospect for Powerbook users, especially considering the low cost of a Mac Mini. To set up Firewire networking, open the Mac OS X System Preferences and choose the Network panel. From the 'Show' pop-up menu select Network Port Configurations and by default you'll probably see 'Internal Modem' and 'Built-in Ethernet' in the area below. Click the 'New' button, and when you're prompted for a name, type in something suitable and then select 'Built-In Firewire' from the 'Port' pop-up menu, before clicking OK. You can now choose the new port from the 'Show' pop-up menu and set up Firewire-based networking in the same way you would for Ethernet. If you want to connect two Macs via Firewire for working with Logic Node, as described in the main text, you don't have to do anything else at this point, other than connecting a Firewire cable between the two machines, as OS X should take care of everything else.